Crafty Owl Does NOT Make Barrels. A list of Cooperages is available below! Cooperage, the art of barrel making, is an ancient skill. With the advances in every facet of culture, it is surprising to learn the actual barrel making process has changed very little. To achieve the highest standards of quality, the time intensive work must still be performed by the hands of a skilled cooper. Actual dimensions vary from barrel to barrel - a result of their being hand crafted. The most common types of oak barrel are the Bordeaux Barrel and the Burgundy Barrel. The differences include size and capacity. Barrel Heads for the Bordeaux style barrel are approximately 21.5" in diameter, whereas the barrel head of a Burgundy barrel is approximately 23". Other oak barrels include the Whiskey Barrel and the Hogshead Barrel. For more information on dimensions and barrel pricing, a list of cooperages has been assembled at the bottom of this page with links to their websites. French Oak was once (and still is by many) considered the most desirable wood for making wine barrels. Most French Oak comes from one or more of the forests planted in the days of Napoleon for ship building. Five of those forests are primarily used for wine barrel making. Allier, Limousin, Nevers, Trancais and Vosges forests produce woods with distinctive characteristics and winemakers select their barrels based on the desired effect for the finished wine. Early experiments with American Oak were not successful as the oak had too much influence on the content of the barrels. At first, the problem was believed to be with the wood itself. Later it was discovered that the difficulties were caused by the way the wood was prepared and the barrel constructed. American Oak barrels have improved dramatically and usage is definitely on the rise. American barrels have lower labor costs (go figure...) and as they are relatively new, not having a long consistent history, they are substantially less expensive than the French barrels. Combination Barrels are barrels made using imported woods. The French coopers making barrels from American Oak and American coopers making barrels from French Oak. Hungarian Oak is also being used for barrel making. If you would like to find out more about how various woods affect the wine, I would suggest a visit to some of the wine information resources of our wine links! Cooperage experts hand select the best oak wood for use in the manufacturing of wine barrels and casks. This selection is extremely important because it essentially determines the quality of the finished product. Wood is selected based on many criteria, including tree shape and growing conditions. These factors determine the textural variety of wood fibers, the fineness of grain and tannin content. Tight grain and fine tannin content are found only in the best wood. To finish assembly, the cooper sets up his (or her) barrel, fits the heads into the "croze" and completes the final hooping with a large mallet. The barrel is tested for impermeability and if passed, the cooper finishes the barrel with final planing and sand papering to enhance the quality of the oak and the perfection of workmanship. It takes approximately eight man hours to produce a single wine barrel. The average wine barrel has a useful life expectancy of about five years. After that time, the barrel has imparted the flavorings of the oak into the wine. 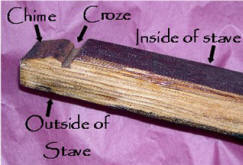 Barrels can be restored, by shaving away several layers from the inside of the staves and re-charring the wood, or adding inner stay oak slates. This can extend the life of a barrel up to ten years, however the results are not the same as with new wood. For that reason, after the initial life cycle of the barrel, most wineries purge their old stock. Often these barrels are cut in half and sold as planters - not a very fitting end for a work of craftsmanship. Folk Artist Tom Crowl sees used wine barrels as a unique piece of history in the culture of wine making. He attempts to use his skills to bring forth a new life for the barrel as wine art for the wine collector and lover. More about Tom's barrel carving skills can be found here. The Following Links can direct you to some Cooperage firms, but please come back! Kelvin Cooperage - Our dedication to maintaining the highest level of quality and service is evident in the care taken at every step of the coopering process to ensure that every winemaker receives a highly crafted, subtly flavored, American oak wine barrel at an exceptional value. Speyside Cooperage - Visitors centre at Speyside Cooperage where you can watch skilled coopers at work. Canton Cooperage - Canton Cooperage Premium American Oak Wine Barrels are made from extended air-dried white oak which is cut in our own stave mills. Bluegrass Cooperage - For over fifty years Blue Grass Cooperage has been known the world over for crafting the highest quality oak barrels for the aging of premium spirits. S. A. Cooperage - Australian Cooperage specializing in the repair and maintenance of existing casks. Canadian Oak - Canadian Oak, Inc. makes wine barrels from Canadian Oak grown in the Niagara Region and other areas of Southern Ontario. Demptos Cooperage - Founded in 1825, Tonnellerie Demptos has forged its expertise over two hundred years, building on experience and new developments. The company is proud of still being a family business, where tradition and close customer relations are paramount. At Demptos, all our skill goes into making top quality barrels to meet the requirements and expectations of winemakers all over the world.